Google Pixel 2 and Pixel 2 XL smartphones are here, and they bring with them sequels to some of the best smartphone cameras available. They’re equal to the task, though – more than, in fact. Google’s changes to the Pixel cameras are mostly on the software side, but they gain some excellent additional abilities, including a new Portrait mode, as well as optical image stabilization to complement Google’s digital anti-shake for photos and video. Google spent a lot of time during its presentation crowing about the Pixel 2 (and Pixel 2 XL, since their cameras are the same) earning the highest ever rating from DxO for a smartphone camera. And that’s not a bad thing, as far as accomplishments go – but for everyday use, a DxO score is about as useful as you GPA once you’ve entered the working world: Maybe something to brag about, but no one else is going to care about anything except the results you produce. Luckily for Google, the results from its Pixel 2 cameras (both front and back) are terrific, and among the industry’s best. Are they the best? That’s going to depend a bit on what you’re after, but you can definitely rest assured that you’ll never regret buying either the Pixel 2 or the Pixel 2 XL because of the quality of the photos they take. In fact, the cameras are a highlight here and a great reason to consider the Pixel 2 as your next smartphone choice. They’re fast, responsive, highly detailed and have great color composition, and they also manage to strike a good balance on the software side of offering a handful of great features, but without feeling overwhelming in terms of options and settings. Most importantly, the Pixel 2 takes stunning photos basically whenever you pull it out of your pocket, double tap the power button to quickly launch the camera, point and shoot. It’s hard to take a bad picture – or at least an out of focus or unbalanced one in terms of exposure and lighting, and that’s the key to making a camera that’s designed for everyone, as opposed to something honed for specialist craft. One of the Pixel 2 camera’s greatest strengths is its ability to exercise restraint despite doing a lot on the software side to clean up things like noise in low light images, and combining different exposures to generate HDR images that have balanced lighting across the scene. The images feel more true to the memory of the actual events, and true to what you see with your eye, than other options from top Android device makers that are intent on boosting saturation and contrast for artificial pop. Another big win for Google is the Portrait mode. In some ways, it’s far less flexible than either the iPhone 8’s Portrait mode, or the Galaxy Note 8’s Focus Shift, since it’s using only one lens to produce its depth effect. But in one key way, it’s more generally useful: It’s far less fiddly to use. Basically, Pixel 2’s portrait feature works just by taking a picture as you normally would with the regular camera, after enabling Portrait from the capture mode menu. The software does its best to produce an image with a sense of depth of field after the fact, and it turns out pretty well – provided your subject is a person or a real animal, like my dog in the examples below. Note 8’s after-the-fact adjustable blur is great, and the iPhone 8’s Portrait Lighting produces some terrific results when used properly, but Google’s solution is arguably the best one for the biggest number of people, since it requires very little patience and produces pleasing results much of the time. Another area where the Pixel 2 builds on the success of its predecessor is in video. The first time around, Google did some amazing things with digital stabilization to produce smooth cuts, even when you’re in motion filming with the smartphone. But with the added optical image stabilization, you can pan, tilt and even walk and shoot without fear of producing something that’s going to unsettle your audience members with motion sensitivity. In side-by-side testing, Pixel 2 XL’s video stabilization (embedded above) came out the winner among iPhone 8 Plus (embedded below) and Samsung Galaxy Note 8. It’s smooth enough that my girlfriend said it had a ‘filmic’ quality, which is high praise. You can see a bit of up-and-down motion in the example provided, but it’s actually not much worse than you get with very expensive hardware gimbals like DJI’s Osmo or rigs designed for use with DSLRs. Google’s front-facing camera is easily one of the best in the industry, and its ability to use Portrait mode sets it ahead of the pack. 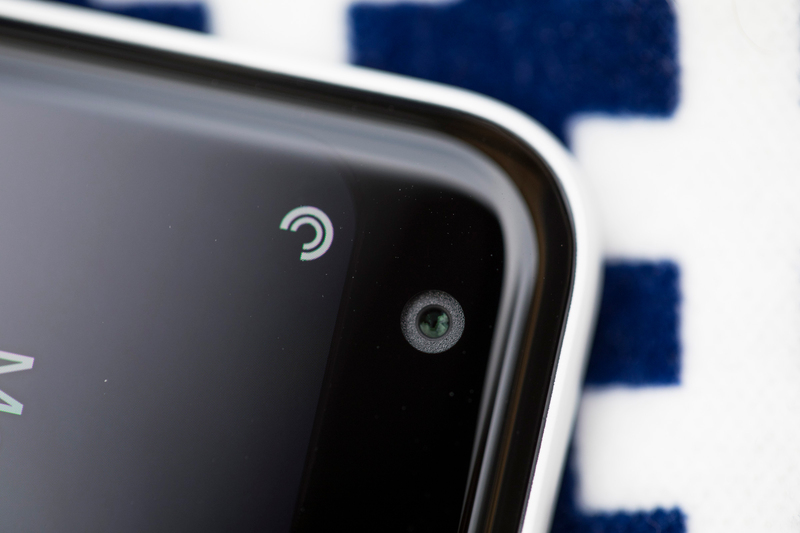 The front camera has only 8 megapixels compared to the rear’s 12, but it makes the most of them, and it gains the advantages of all of Google’s software magic just like the back shooter. Fixed focus means that it’s not well tailored to taking other kinds of pictures, but if you’re using it for that, you have to question why. I am not generally prone to taking selfies, but the Pixel 2 had me indulging more than I even expected for the purposes of testing. It handles varied lighting conditions with aplomb, and again, portrait mode gives it an extra bump in terms of generating impressive results. Now if only it could automatically remove gray hair from beards and heads. The Pixel 2 and Pixel 2 XL had a lot to live up to thanks to the strong photographic performance of their predecessors, but Google has improved the cameras in nearly every respect, and particularly in areas that count for most user. I was generally impressed with every aspect of the photo taking experience on the devices, and with video capture, too. If there’s anything that it’s lacking, it’s the ability to shoot 4K at 60 fps like the iPhone 8 can manage, or do 240 fps slow-mo at 1080p. But Apple’s using its own new media formats to make that possible, which limits the usefulness of those features anyway. The Pixel 2 is also now the best camera when it comes to aiming for true color reproduction, which you can see for yourself in the comparison examples below. Ultimately, the Pixel 2 camera is likely the best all-around camera you can get on a smartphone. It lacks a second lens for zoomed shots, true, but that’s a feature most people will actually use maybe 5 percent of the time anyway. And it excels not by addressing edge cases, but by being the best for the things people generally want cameras for anyway – shooting images quickly and conveniently in a range of settings, and having them turn out results you actually want to look at and share.